We provide tools to improve communication efficiency within a school district or educational organization so its leaders can focus on educating students. A redesigned website developed and hosted by eSchoolView continues to improve communication between a Pennsylvania district and its residents as a new school year gets underway. Titusville School District opened its doors to more than 2,100 students this week, and data show the new website proves to be a valuable tool with visits, page sessions and time spent on the site incline. In fact, gorockets.org was awarded a Golden Achievement Award by the National School Public Relations Association in July. The district was commended for its plan to overhaul the site in an effort to improve communication between home and school. Jeremy O’Toole, the district’s media specialist and webmaster, said Google Analytics played a significant role in the investment to redevelop the site. Data from the new continue to improve, indicating eSchoolView’s restructure exceeds user demand. The site, which is built on a content management system eSchoolView designed specifically for education-based clients, is mobile friendly. The responsive design conforms to end-user devices, from smartphones to tablets and desktops. “Our main priority is to listen to our clients and produce results that meet specific needs,” Rob O’Leary, eSchoolView’s executive director, said. “We provide tools to improve communication efficiency within a school district or educational organization so its leaders can focus on educating students." Intuitive navigation, an emphasis on crisp graphics and the prominent role of a photo gallery are key elements to the new designs. Less emphasis on text also increases interaction between the site and end-user. Titusville also has seen a significant uptick in followers across its social media channels as a result of the redesign. Improving two-way communication through social networks was identified as a priority for the structure of the district's new site. 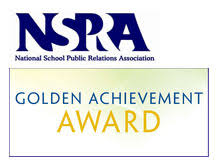 NSPRA Golden Achievement Awards recognize exemplary work in all aspects of school public relations, communication, marketing and engagement. Each entry is judged individually against the defined criteria. A number of other eSchoolView sites have been recognized by the organization in the past for their form and function. eSchoolView works with public, private, charter and faith-based K-12 schools across the United States. Its easy-to-use Content Management System (CMS) and other integrated products help districts expand their reach by embed blogs, surveys, RSS feeds, e-newsletters, podcasts, videos and live broadcasts. eSchoolView was created in 2008. Earlier this month, the company was named to the Inc. 5000 list of fastest growing privately held companies in the U.S for the fourth consecutive year, an accomplishment that puts eSchoolView in rare company.